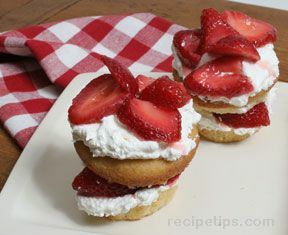 Beautiful strawberry shortcakes that will delight everyone. Use them as your dessert for entertaining and let your guests make their own. Perfect when the strawberries are in season. Preheat oven to 350Â°F. Place 12 paper liners into wells of muffin pan. For crust, place pretzels into large resealable plastic bag and finely crush. Combine pretzel crumbs, butter and sugar in a small bowl; mix well. Drop scoops of pretzel crumbs into liners. Press crust into liners with with a small glass. Combine cake mix, sour cream, egg, water and vanilla into a batter bowl; stir until smooth. Divide batter evenly among prepared muffin cups. Bake 15-18 minutes or until wooden pick inserted in centers comes out clean. Remove pan from oven; cool 10 minutes. Remove cupcakes from pan and cool completely. Meanwhile, combine 1 cup of the whipped topping and 3 Tablespoons of the strawberry ice cream topping; mix well. Gently toss strawberries with 1 1/2 Tablespoons of the strawberry ice cream topping. When ready to serve, remove paper liners from cupcakes. Slice off tops of cupcakes. For each serving, place bottom of cupcake on serving plate; scoop filling over center of cupcake. 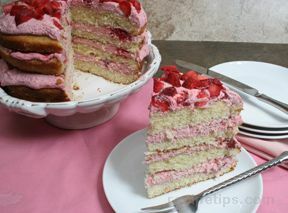 Spoon a rounded tablespoon of strawberries and juice over filling; top with cupcake top. Dollop with remaining whipped topping over desserts and drizzle with about remaining ice cream topping. Serve immediately. 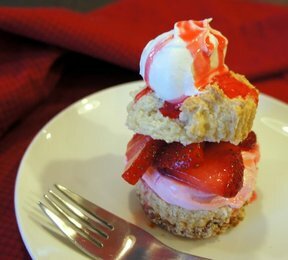 "I'm a big fan of strawberry shortcake so I loved these. 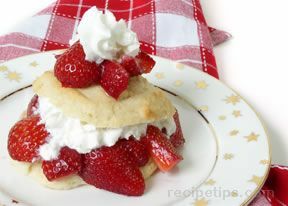 I liked the shortcake part of it, a little softer and lighter than normal."